Mary Tocco of Michigan Opposing Mandatory Shots (MOMS) delivers one of the most compelling presentations on the dangers of vaccines. Mary tells her story beginning with her decision to resist vaccinating her children through to the process of research and discovery supporting her decision. Mary's 26 years of vaccine research and activism has resulted into a 2-hour, 24-minute presentation that combines history, experience, logic, science and corporate-neutral compassion into a lesson that parents and professionals alike can understand. Plus, Mary is so lovely and her voice so pleasingly strong that it is effortless and enjoyable to follow her reasoning into adopting an informed opinion regarding the safety and efficacy of vaccines. 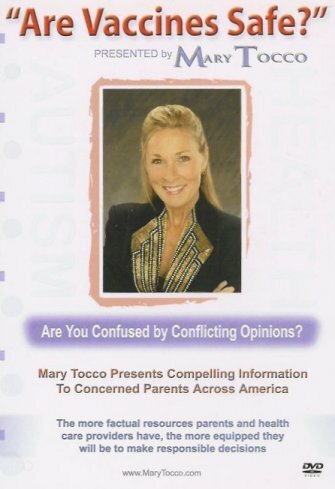 When we sat down to review Mary Tocco’s DVD presentation Are Vaccines Safe? we were quite impressed with her ability to bond with parents most pressing questions concerning vaccines. She covers her topic in a logical format, initially exploring what we have been told about vaccines by the media, educational institutions and our society. She explores each vaccine “myth” with logic, personal experience and documentation. Mary gives her audience the right amount of science for the average parent: just enough to lend credibility but not so much that the presentation gets bogged down in details. She cites her sources always encouraging parents to do their own research regarding this important health care decision. Topics covered include the autism/vaccine connection; SIDS/SBS and vaccines; how vaccine are made; common ingredients in vaccines; the known risks of vaccines; how to determine if your child is suffering from a vaccine reaction; how to appropriately deal with a sick child; and our rights as parents to make health care decisions for our children. Since many parents want to defer their medical decisions to medical doctors, Mary Tocco wisely utilized Dr. DeMio, MD in the introduction and closing of her presentation on vaccines. If you are looking for a convincing presentation for that “dyed in the wool” pro-vaccinator in your midst, this is the one DVD you want to make sure they watch.